Repurpose an old bed frame into a swing to create a comfortable outdoor living space in your sunroom or back porch. Kids and adults alike will be drawn to the cozy respite when you pile it high with pillows and soft bedding. Construction materials are available at your local home improvement store. Though one adult can perform the necessary steps to transform the bed, two adults are necessary to hang the completed swing. Transform a vintage bed frame into a cozy swinging bed. Sand the bed frame with an electric sander and wipe off any excess dust with a rag. Paint or stain the frame the desired color. Allow the frame to dry completely. You can skip this step if you like the original color of the bed frame. Cut 4 braces from the 2-by-4 boards using a saw if your old bed frame does not already have existing braces. These should be the same width as the inside of the bed frame. Lay the braces an equal distance apart across the bed frame and screw them into place with wood screws. Cut the plywood according to the dimensions of your bed frame to form the support bottom of the swing. Lay the plywood on top of the braces. Secure the board in place with 1 1/4-inch screws. Drill holes the size of the lag eye bolt 5 1/2 inches from each corner on each side of the bed frame, totaling 8 holes. Insert a lag eye bolt into each hole. Slide a screwdriver through the eye of each bolt and use it as leverage to tighten the bolts. Drill four holes the same diameter of the lag eye bolts in the ceiling joists where you will hang the porch swing. These holes should correspond to the corners of the bed frame. Insert 4 lag eye bolts into the holes and tighten. Run a length of chain through one ceiling eye bolt and down through the 2 bolts on one corner of the bed frame. Connect the ends of the chain with a quick link or carabiner, forming a triangle with the chain at the corner. Repeat for the remaining corners and ceiling bolts. Adjust the chains so that the swing is even, using the level if necessary. 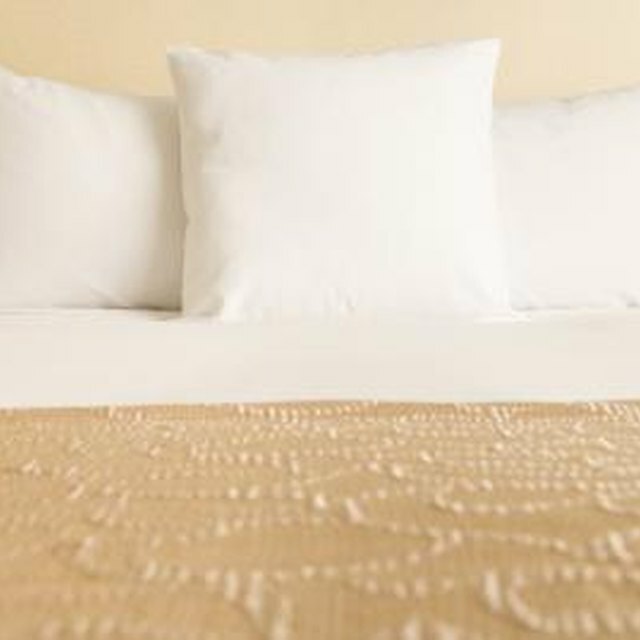 Lay the mattress on the bed frame and cover with bedding and pillows. Set the bed frame on two sawhorses to hold it up while you hang the chains.